I needed to renew my passport and I also needed to apply for a passport for Shern. We woke up early and initially planned to scoop Shern up from bed and just bring him into the car with him still sleeping. But guess we were too noisy and he woke up feeling all hyped to be able to go out 'kai-kai' so early. We got him changed and he was asking us to put on his shoes for him happily. Reached the Immigration Office in Beach Street almost 8am. Got our numbers (#1XXX) and to our horror, it was 40 numbers away. The lady who issued us the numbers told us to go back to her at 8.30am if our numbers were not being called yet. At 8.30am sharp, we went to her and she gave us another queue line (starts with #2XXX) which turned out to be the Priority Queue for the elderly, disabled or kids below 2yo. She should have given us this number for Shern earlier. We waited for 1/2 hour for nothing. We felt cheated! We were like mumbling under our breaths cursing the person. Haha. But there was nothing we could do then. And let me tell you this, it was not easy pacifying a 1 1/2-yo-toddler in a small space full of people. After being there for 1 hour, I had already used up all ways to pacify him. I had read him books. I had given him his toy cars. He finished his biscuits. He finished a mini box of raisins. Shern was getting restless! And for the next hour, I carried him outside, showed him buses, lorries, motorbikes and other vehicles. He seemed fascinated by them and always pointed to them excitedly whenever he saw Rapid Penang Buses sped by. But then when I took Shern inside, he refused to go in. He wanted to stay out there to see those buses! After given the priority queue which was just 5 numbers away, we still had to wait for almost another 40 minutes. And when it was just a number away, I simply had to forced Shern inside to be prepared for our number to be called. Shern was making a big fuss then. I had to constantly distract Shern and hoped he forgot about those buses! It was exhausting! And finally when our numbers were called, the men did not even take a glance at Shern. Why ask us to bring them here if they don't even take a glance at them! All they asked for is their original and photocopy of the child's birth cert, a parent's I.C, and 2 passport-sized photos. No fingerprint needed from children below 2. We left the place at 10.15am. Collection time was 11.45pm. Took Shern home to yee-pho for him to take his nap. Shern slept as soon as we got into the car, he was so tired. Hubby & I then went to collect our passports at noon. And luckily, collection was fast and efficient. I waited for less than 10 minutes for them. Anyway, it was only RM150 for 5-years validity for children below 12. RM300 for adults with 5-years validity. It was really nightmarish to bring a 1 1/2-yo-toddler to places like this. We are always reluctant to bring Shern to restaurants because usually he would not sit still for long. And they expect toddlers to be good and sit still for 2 freaking hours applying for passport. Gah!!! Well, this is what we got for paying RM150 and spending 2 hours there. Shern's first passport. And oh, I forgot to mention that it was another big fussy session when I brought Shern to take his passport photos at the photo studio! Lots of wailing and some tears involved to get Shern's photo taken. Don't they look so cute with the little coat on? :) I was fortunate with Hannah that we didn't have to wait long and I got the priority queue number straight away. If not, surely it would have been a nightmare for me too! I have almost the same experience as you did with Jaden in the Penang Immigration office. Thankfully, both my parents were there to help me keep an eye on him while he went touring every nook and cranny of the building. I trust Jaden knows the layout of the building very well by now. As for the queue, we did not really wait long since it was not holiday season when we went to do and well, Jaden has to take fingerprint and that was so cuteeeeee.. the tiny fingerprints! Educate me a bit, the kid need to have his own passport, or the kid is actually attached to the parent's passport? If I had a few kids, does that mean each and everyone of them need to have their own passport? Where is the photo shop which can take and edit kids photo? emily...at least jaden wanted to tour every crook and cranny of the building. mine juz refused to get into the building. he juz wanted to stay outside the hot sun to watch those freaking rapid penang buses! haha. i understand u...realy lucky they did not reject the photo. if not sure cham. 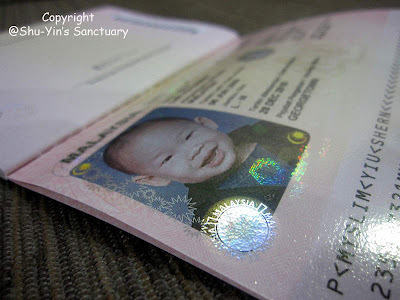 giapseng....i think for now, no more attachment to parents passport allowed. im not too sure though bout this. mine is their own individual passport. Really recommended to go there for kids passport photo.